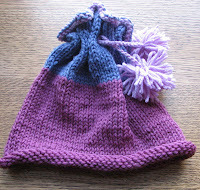 I've been slacking on my blog entries for the "Warm Ewe Up" swap. Here's the current topic: What knitting/crochet pattern have you worked that you could see yourself making over and over and never get tired of? I'm someone who doesn't tire of doing things over and over if I enjoy them. I find them comforting, I guess. I'm happy to eat the same thing for several days in a row. I can make a big pan of veggie lasagne and eat it for days. When I used to do the Ann Arbor Art Fair, I always read Pride and Prejudice while I sat in my booth. Every year. So I think I could handle making one pattern over and over. Probably a felted bag. When I participated in The Big Bag swap, I made the first bag and then right away ma de another for a swapper who didn't get her package. I didn't mind it, but I wasn't in love with the pattern so I probably won't make more. 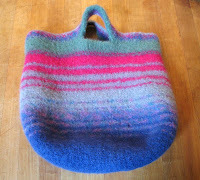 But if I found a pattern I absolutely loved, I suspect I could make many of the same bags. And then there's the Kringle hat from Hip Knit Hats. I've made 7 -- 5 for nieces, 1 for a swap partner, and 1 for Warm Woolies. I could make more if I had more victims. :) They're easy, colorful, and awfully adorable! Giveaway on the PhatFiber blog!